Lightly brush 8- inch round pan or an ovenproof plate with vegetable oil. Place cheese in center of pan. Do not peel coating from cheese. Bake uncovered 8 to 10 minutes or until cheese is soft and partially melted. 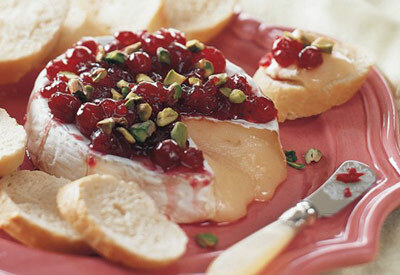 Top cheese with cranberry sauce and nuts. Serve immediately with bread or crackers. Recipe source: Betty Crocker and General Mills Corp. Void if altered, copied, sold, purchased, transferred, exchanged or where prohibited or restricted by law. One coupon per purchase of specified product(s). Good only in USA, APOs FPOs. CONSUMER: No other coupon may be used with this coupon. Consumer pays any sales tax. RETAILER: EPIC Provisions will reimburse you the face value of this coupon plus handling if submitted in compliance with our redemption policy. Copy available upon request. Cash value 1/100 cent. Send to EPIC Provisions 8, NCH Marketing Services, P.O. Box 880001, El Paso TX 88588-0001 or an authorized clearinghouse.